Copper 145, or Tellurium Copper is often used for transformer and circuit-breaker terminals, welding torch tips, and fasteners. The addition of a very small amount of Tellurium to the copper alloy gives fantastic machining properties as well as making the copper less malleable and thus less likely to be dented during use. Copper was one of the first metals man learned to work. During the Chalcolithic period copper came in to predominate tool use far out pacing stone tools before the onset of the Bronze Age. Copper has long since fallen out of favor for tool making thanks to its poor edge holding capabilities and soft, rather malleable nature. Today copper is used primarily in electrical power lines and electronics as it is one of the best conductors of heat and electricity around. A Copper d20 weighs in at approximately 550 grains. Any idea when Dragon’s Dice might be available again? Hopefully after they get caught up from the people that paid for them months and months ago and some that are still waiting from 2013.
we aren’t taking any more orders for dragon’s dice until we get our back log caught up. once we do we will enable their checkout options on the site again. 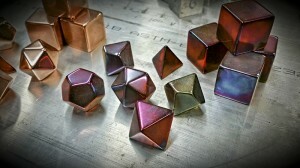 we are currently waiting on a lens for our laser engraver that we need to get replaced to engrave the metal dice. It’s mid Feb 2015 and I’m curious when these will be available again. Thanks! I’m curious too. The Facebook page has no indication of an update about the equipment issues. I’d love to get my other half some of these…if they were available. There are currently 93 people that ordered metal dice directly off of the website (mostly between August 10th and November 3rd) or through invoices. Many of you have emailed us off and on over the last couple of months, so I’m sending an email to all of you at the same time so we’re all on the same page. In August we were anticipating that it would take about 3 months to start sending out orders, unfortunately once we got most of the dice made we realized that we had a serious issue with our laser engraver that required a different type of lens than the one we have. We still haven’t gotten a new lens from the manufacturer but Charlie has figured out a work-around to the problem. 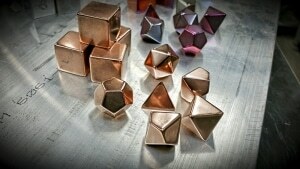 We’ve also realized that shipping metal dice in our regular boxes is not a good idea. The much greater weight of the dice tend to break boxes when they are thrown around by USPS, and they scratch each other up and sometimes break through the package. Right now Charlie is designing a new box that has individual pockets for each die, similar to the boxes we use for the acrylic sets. For those of you that had individual d20s, we are thinking that we’ll make single die pouches from leather. We’re not exactly sure when we’ll have these ready to ship out, there are thousands of dice that need to be engraved and the folks the bought all of our equipment through Kickstarter have been waiting much longer, so they’ll get their dice first. The single d20s orders should start heading out sometime in the next month however. We’ll be sending along something extra for the long wait.